In 2000, an explosion in a fireworks factory wiped out the entire Roombeek district in the city of Enschede. Stichting Droombeek [Droombeek Foundation] responded with a digital project that enables individuals to call up memories of the area with the click of a mouse. Using digital technology, residents add their own images and stories to the website, which can then be accessed by visitors to the digital district, who may in turn add their own experiences to the mix. By linking the present to the past in this way, the website becomes a ‘lived’ space. Events and places are inextricably linked to one another. Something happened here, or there. Sometimes we erect monuments, cement a memorial stone into a wall (‘On this spot Wim van Est fell into the ravine’), or carve names into a bench or a tree. Places have memories. Nearly everyone has at one time or another wondered what a place looked like in the past and wanted to see and hear how it was in days gone by. 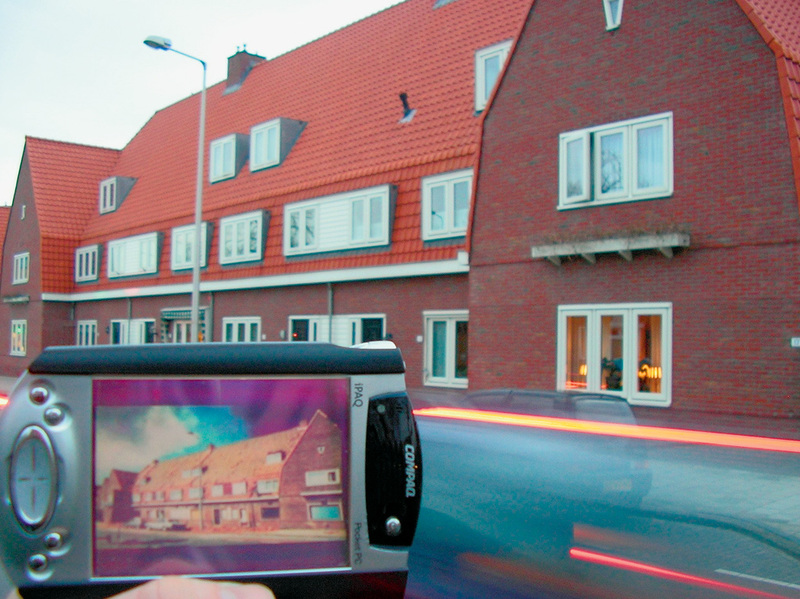 The Droombeek project aims to record and make accessible the past and the future of Roombeek, the Enschede residential development that has been built on (part of) the site of the fireworks disaster of 13 May 2000. On the website we read: ‘Each place has its own memory. The physical space of the city provides us with a peg on which to hang our recollections. But what if the place is no longer there? What happens then to the memory of that place?’ In Enschede the place – Roombeek – was violently obliterated, not gradually transformed in the usual way of inner-city locations. The fireworks disaster struck a deep wound in the soul of Enschede, which makes the question, ‘what was it like here?’ all the more poignant. As such, Roombeek differs from all those other new housing developments being built on virgin polder land. At first glance, digital Droombeek is reminiscent of the neighbourhood websites set up in parallel with a particular housing development in order to get future residents involved with their new neighbourhood at an early stage. The other association that springs to mind is with story networks like Geheugen van Oost, in which the stories of residents of Amsterdam East are linked on the basis of meta-information. Neighbourhood websites and story networks both rely on the contributions and involvement of residents; they are out-and-out community projects. Their success depends on a number of factors, like design, the balance between the freedom to make individual contributions and editorial control, and embedding in existing structures. This last is one of the reasons why they often collaborate with schools, local associations and old people’s homes. Droombeek, too, is firmly anchored in the local community. It collaborates with, among others, local museums and the Enschede ‘House of Stories’, a pastoral care project established by Enschede churches in the wake of the fireworks disaster. Droombeek is trying, as it were, to encapsulate the virtual ‘genius loci’ of Roombeek. And, like many other neighbourhood websites, it is also attempting, as Michel de Certeau would have it, to turn the empty place (‘lieu’) into an inhabited social space (‘espace’).1Its ambition is to transform the barely inhabited new-build district into ‘social space’ by the act of sharing stories. Droombeek is pursuing a dual strategy; even a triple strategy, in that it can also be an instrument for helping former residents to cope with the traumatic history of their district. Private stories become public and part of a political act. After all, in the classic view of things, making something public is a condition for political action. Because of the way the various collaborating bodies operate (the museum and the school ‘ask’ whether you would like to contribute) it looks like a top-down political action. Yet this is not the case. Rather, it should be seen as a first phase, a sot of ‘kick-start’, which will eventually result in residents contributing of their own accord. Moreover, residents don’t have to write (or take photos or make videos) specifically for Droombeek; just linking content, which may well already be available elsewhere, to Droombeek is sufficient. As a story network on the web, Droombeek still has some way to go, however. There are not enough stories and the content categorization needs a bit more fine-tuning. But the latter only makes sense with a greater quantity of content. Nonetheless, it would be a grave mistake to dismiss the project as ‘an excellent concept, reasonably well executed, but . . .’. The real significance of Droombeek lies in the technical execution and its consequences. These are extremely interesting. Droombeek is above all a well-thought-out ‘locative media project’. Each story in the Droombeek database is supplied with geographical coordinates; it is localized information. Those submitting a story can ‘pinpoint’ it to a specific location. Anyone who has a laptop with wireless Internet connection and a gpsreceiver will in future be able to enter Roombeek and call up stories, images and sounds associated with the particular spot on which they find themselves – and even add to them. Not all that difficult, you might think. Most of the technical infrastructure is already present. Assigning coordinates to objects in a database is easy, it is meta data, just like ‘date and time’, ‘permalink’ (the permanent Internet address of, say, a text), ‘author’ and ‘title’. You could, for argument’s sake, use Google Earth for the purpose. As long as you have wireless Internet access, of course. This is something of a stumbling block at present because, unlike the mobile phone network, it is not universally available. Many of us carry devices around with us that can register our location, and increasing numbers of enthusiastic walkers, long-distance cyclists and gadget junkies own gpsreceivers. The integration of the various technologies into one handy device is still a problem, however. And that limits the scope of projects like Droombeek for the time being. At this point in time ( 2006) Droombeek consists primarily of a website that was developed as a pilot project. Efforts are now under way to ensure that from the beginning of 2007, visitors to the various museums in the area will be able to borrow a handheld computer (pda) with inbuilt gps receiver which they can then take along with them on a ‘digital’ stroll through the district. The pda would contain some thirty stories and five videos made by students of the local Academy of Art and Industry ( aki). That is in itself enough material for an attractive digital walk. But to generate the links that are needed for personalized walks, the content will have to grow considerably. And that may take years. The fact is that Droombeek was not created as a finished project but rather as a framework to be filled in by users. When the database contains thousands of stories, comments, videos and sounds, navigating or clicking through the stories will be a bit like logging on to the spirit of the place. Right now, however, there is little difference between that localized information and a virtual, on-the-spot information board. Within a few years that will change and information will also be location-sensitive as a result of ‘Geo Tagging’ (adding geographical coordinates to information). That location-sensitive information will be supplied by anyone and everyone, so it is to be hoped that it will not take the form of unsolicited content (turn on the spam filters, please!) 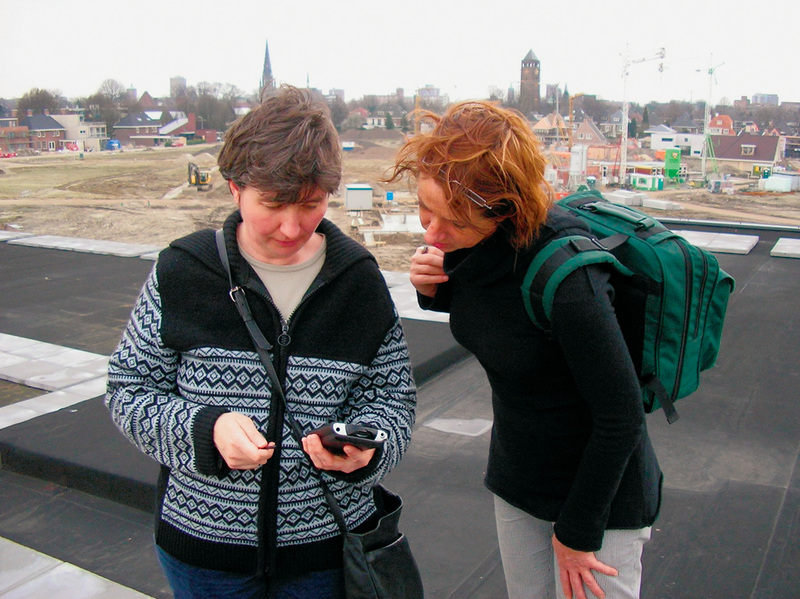 but of information that you have asked for – for example, by indicating during a walk through Roombeek that you would like to read or hear the Droombeek stories. Droombeek would then be a filter, or meta tag. You would give permission for content with those characteristics to appear on your computer pod while you are walking through the neighbourhood. If an Internet connection is not available everywhere, the content you download might take the form of an annotated gpswalk, a collection of ‘waypoints’ with related information. For the time being, Droombeek is just a website and a digital walk. But it also affords a glimpse of a possible future in which we will all be linking our stories, comments and ‘tags’ to places, quite literally laying a network of text, image and sound over the entire globe in what could be called a form of ‘ubiquitous localized publishing’. It is vital to start developing projects and applications capable of conveying a meaningful experience in such a situation and in so doing become a form a public action, as virtual graffiti (carving your name virtually on a place the way people now do on information boards) already is and as story projects like Droombeek have the potential to become because – in theory at least – they turn a place into a lived space. It is possible that we have always done this: we tell stories in order to create space – the aboriginals used ‘songlines’. The difference is that in future we will be able to ‘tune in’ on any street corner to the murmurings and sounds of the place we are in, to its history, associated desires, irritations, traumas. Whether you want to hear that ‘ubiquitous localized history’ will – hopefully – be up to you. Droombeek was developed by Map&Movie (cartographer Edward Mac Gillavry and documentary maker Peter Dubois) in collaboration with the Telematica Institute. The pilot project in the spring of 2005 was partly financed by Digitale Pioniers. The project proper commenced in May 2006 and will run until 2007. It is jointly financed by VSB Fonds, Prins Bernhard Cultuur Fonds, the City of Enschede, the Domijn and de Woonplaats housing corporations, Rijksmuseum Twenthe and Stichting Enschedese Aannemers: www.droombeek.nl. 1. Michel de Certeau, ‘Spatial Stories’, in: The Practice of Everyday Life (Berkeley: University of California Press, 1984), 117. 2. Michel de Certeau, ‘Walking in the City’, in: ibid., 108. Arie Altena writes about art, technology and new media. He is an editor / researcher at the V2_Archief in Rotterdam, teaches Interactive Media and Environments at the Frank Mohr Institute and is a co-organizer of Sonic Acts. In 2006 he conducted research at the Jan van Eyck Academie. His blog research project, In the Loop, is part of the Ubiscribe project, for which he also edited the POD book Pervasive Personal Participatory, Ubiscribe 0.9.0 (2006).